India have disgraced themselves: Who is to blame? Bowled out inside 30overs for less than 100. What a day for India’s batsmen. Concede over 100 runs in 11 overs against England’s tail. What a day for India’s bowlers. Smashed by an innings and 244 runs. What a day for Indian cricket. Routed inside three days for the second time in a week. India are in pieces, their players under fire, the coach – Duncan Fletcher – has been sidelined by BCCI and the Captain, MS Dhoni thrashes about in a London hotel bed wondering what the hell comes next? It’s an ODI Series and Ravi Shastri has been hastily appointed by the BCCI to run the team during the series. The move effectively demotes Fletcher and adds confusion to India’s set up. Will it help? Well India haven’t won an ODI on their last two international tours. Shocked? Don’t be. The players have little to no chance of working hard on faulty techniques or improving their games. India’s Board of Control for Cricket in India have established a relentless schedule of matches decimating all reasonable opportunity for rest, recuperation and meaningful practice. Oh what a shame you say? They’re millionaires, right? Yes, but all cricketers must work long and hard to exorcise bad habits and polish technique. The Test series defeat reveals a lack of strategic training and toil at first class level. Virat Kohli, Cheteshwar Pujara and Ajinkya Rahane represent the future of India’s batting, but their lack of mental fortitude in tough circumstances and adaptability were wildly exposed by England throughout this series. Shikhar Dhawan, another batsmen who might have had a future with India, was replaced after 3 Tests by 32 year old opener Gautam Gambhir, a regressive selection that backfired. Gambhir looked haunted and worked to avoid the strike during his four innings in the series and, on his last day of torment, was pathetically run-out a few minutes before lunch when clouds threatened. India visit Australia for 4 Tests in the southern summer and their batsmen must be absolutely shaking with terror at the prospect of facing the Aussie pace battery. India also lack genuine wicket-takers. Cast your thoughts back over the years. Can you rattle off a selection of top notch Indian bowlers who’ve consistently taken wickets home and away? They seem to have cobbled together bowling attacks, just enough to get by and sure, guys like Zaheer Khan were quality and Ishant Sharma is kind of okay I suppose (he wouldn’t get a game for Australia, England or South Africa with a bowling average of nearly 37). India lack spearheads. Ravichandran Ashwin has potential as a spinner and Bhuvneshwar Kumar was their best player in this series and maybe India should build their pace attack around him, but he won’t be the spearhead they crave. He doesn’t have raw pace and Dhoni’s overuse of Kumar flattened him. Dhoni himself mostly batted with defiance throughout, but his captaincy and wicket-keeping were second rate. He is a fighter, a man of character who, despite possessing a pedigree most suited to short-form, has proven that resilience of character and resolute commitment often gets you over the line in Test Match cricket. Better cricketers than Dhoni have failed to make any dent in the Test arena because they lacked those attributes. But, after this embarrassing 3-1 defeat to England, where his side have squandered a 1-0 lead, can he retain the captaincy of the world’s most popular cricket team? The hashtag #dhoniout has been trending on Twitter for over 12 hours now so perhaps India’s fans have already indicated a clear choice. English readers are saying “what about OUR performance?” Yes, yes I know, you won 3 Tests and bounced back from near oblivion with great aplomb. Alistair Cook has revealed that he nearly quit the captaincy in June after England suffered home defeat to Sri Lanka. His wife convinced him otherwise. After 2 Tests against India, a draw and a painful defeat at Lords and a whole lot of snicking to slip with no runs, Cook must’ve been thinking “gee thanks wife, now I’ll be sacked in disgrace”. But Cook, the senior players and coach Peter Moores have orchestrated a thrilling fight back. Anderson was tremendous, Broad was great and Moeen Ali showed that he can get wickets (but remains questionable as a top 6 Test batsman). Gary Ballance looks all class and new keeper Jos Butler can play. Don’t get too excited just yet. India were ordinary opposition and Australia’s visit up north next year will be tougher. Sri Lanka’s batting legend is currently playing his last Test Match. He scored 54 in his final innings against Pakistan. The 37 year old has played 148 Test Matches, scored 34 hundreds and will finish with a batting average of 51+. A world class cricketer and great servant of for Sri Lanka. Many will mourn his loss, but Sri Lanka are producing exciting cricket talent and their Test future is bright. 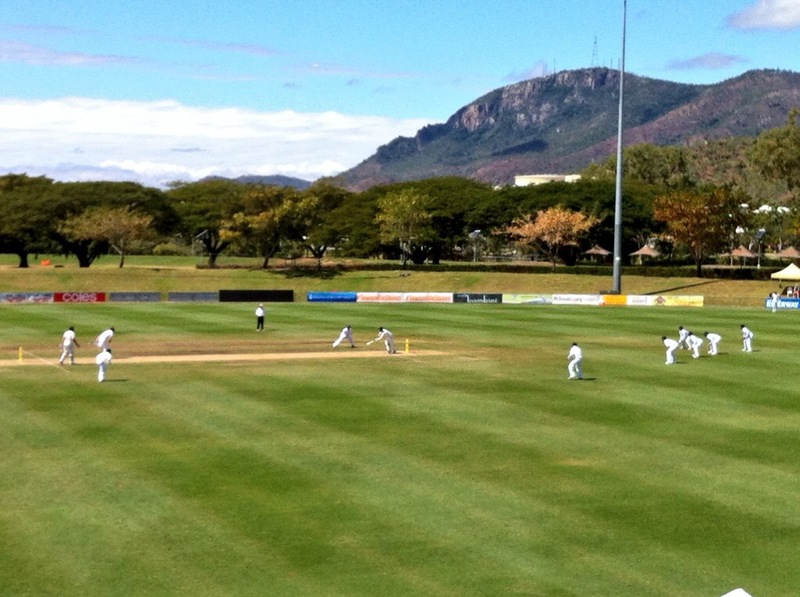 The 2nd match between Australia A and South Africa A in Townsville finished in a draw after a washout on day 2. Seventy five mm of water fell during Friday disappointing myself and a few others who had organised a day off work. Townsville’s long term August rainfall average is 15mm. A bookie would have offered you 100-1 if you’d said that 75mm of rain will fall on a Friday in Townsville in August, the day you plan to take off-work to watch a rare 1st class cricket match. Blue skies shone the next day and Phil Hughes scored a memorable 243 not out, earning an ODI call up for the Zimbabwe tour and staking a claim (again) on a Test recall. That might inspire groans from Aussies or laughs from Englishman, but Hughes is only 25. With further development he could still make it at Test level. The 2 match series in Townsville was a success. It was reported over the weekend that Townsville City Council and Cricket Australia are negotiating the application to have Tony Ireland Stadium certified for Test Matches. Cricket Australia are impressed with the facility and suggest only minor upgrades – such as improved lighting for television broadcasts – would be needed to attain accreditation from the ICC. It would become the eleventh Australian venue to receive ICC approval. This would be a huge asset for cricket, Townsville and Northern Australia. Make it happen people.